^ "Larry Steele Stats". basketball-reference.com. Retrieved 2010-02-27. ^ "Rick Barry Stats". basketball-reference.com. Retrieved 2010-02-27. ^ "Slick Watts Stats". basketball-reference.com. Retrieved 2010-02-27. ^ "Don Buse Stats". basketball-reference.com. Retrieved 2010-02-27. ^ "Ron Lee Stats". basketball-reference.com. Retrieved 2010-02-27. ^ "M.L. Carr Stats". basketball-reference.com. Retrieved 2010-02-27. ^ a b c "Micheal Ray Richardson Stats". basketball-reference.com. Retrieved 2010-02-27. 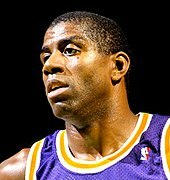 ^ a b "Magic Johnson Stats". basketball-reference.com. Retrieved 2010-02-27. ^ "Rickey Green Stats". basketball-reference.com. Retrieved 2010-02-27. ^ a b c "Alvin Robertson Stats". basketball-reference.com. Retrieved 2010-02-27. 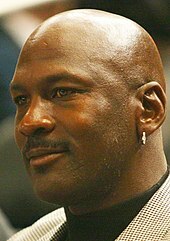 ^ a b c "Michael Jordan Stats". basketball-reference.com. Retrieved 2010-02-27. ^ a b "John Stockton Stats". basketball-reference.com. Retrieved 2010-02-27. ^ "Nate McMillan Stats". basketball-reference.com. Retrieved 2010-02-27. ^ "Scottie Pippen Stats". basketball-reference.com. Retrieved 2010-02-27. ^ "Gary Payton Stats". basketball-reference.com. Retrieved 2010-02-27. ^ a b "Mookie Blaylock Stats". basketball-reference.com. Retrieved 2010-02-27. ^ "Kendall Gill Stats". basketball-reference.com. Retrieved 2010-02-27. ^ "Eddie Jones Stats". basketball-reference.com. Retrieved 2010-02-27. ^ a b c "Allen Iverson Stats". basketball-reference.com. Retrieved 2010-02-27. ^ a b "Baron Davis Stats". basketball-reference.com. Retrieved 2010-02-27. ^ "Larry Hughes Stats". basketball-reference.com. Retrieved 2010-02-27. ^ "Gerald Wallace Stats". basketball-reference.com. Retrieved 2010-02-27. 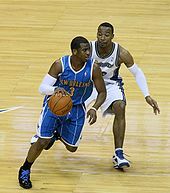 ^ a b c d e f "Chris Paul Stats". basketball-reference.com. Retrieved 2010-02-27. ^ "Rajon Rondo Stats". basketball-reference.com. Retrieved 2010-04-20.